It's a strange question to ask, especially since the Paick Watch Light is still gathering pledges toward its construction out at Pozible.com. But for those who plan to spend a lot of time outdoors this summer—and that covers a good swath of the population—having a Paick Watch Light on hand may mean the difference between pleasant fun in the sun and a painful sunburn, as well as some other useful tools for fun and safety this summer. The Paick Watch itself, at last report, has been around for the last year, but the Paick Watch Light has only just emerged. 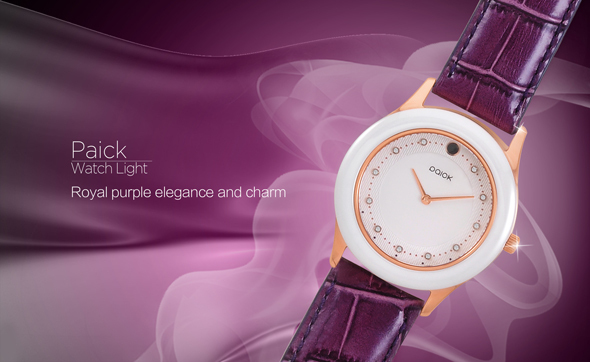 The Paick Watch Light offers some very specific design changes, with reports suggesting that a lot of the changes were the result of feedback from female fans. It's set to come in four different colors—blue, red, purple and white—and uses 11 Swarovski crystals to mark the number spaces one through 11. The face itself is zirconia ceramic, and the watch uses stainless steel, rose gold electroplating, and sapphire glass to provide not only an elegant but also durable overall structure. But what makes the Paick Watch Light different is its smartwatch abilities. It's water resistant at three atmospheres of pressure, and allows for connectivity to a mobile device via Bluetooth 4.0 chip. Perhaps its best function is its included capability to detect ultraviolet (UV) light, and provide updates to the user about when is a good time to switch to sunscreen. That UV sensing capability can further be used as a means to detect just how much vitamin D has been absorbed, and when it might be a good time to seek shelter, making it great for use with children. It's not just a UV tracker, though; the Paick Watch Light comes with fitness tracking options that can count steps and perform real-time detection of total calories burned, and incoming call alerts give a user more options in terms of taking a call. Pricing seems to be around $160 each when released in retail, though several options exist for users to support the project at the Pozible level and get some discounts. The Paick Watch Light is releasing into a pretty crowded house of products; wearable tech has been a big movement for some time now, and the sheer number of smartwatches and fitness trackers out there is substantial enough to make the Paick look more like “one among many” than anything else. That UV tracker option is somewhat unusual in the field, however, and that may give it a market advantage. The big problem there, though, is when a product's competitive advantage can be summed up in one extra feature, it becomes comparatively simple for everyone else to add a similar feature should it prove popular, and thus pull the rug out from under the new product. It will be interesting to see how the Paick Watch Light does when it goes into a wider release, though given that the project has already met its goal of $3,221 and exceeded by nearly $1,900 with 25 days left to go, it may well have some happy users waiting. It's got a reasonably novel concept and some good looks attached, but only time will tell if that's enough to compete in a packed house.